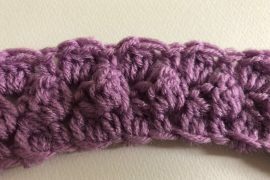 There are several different textured crochet stitches that look similar but each has its own unique way of being made. Bobbles, clusters, shells and popcorn stitches are all advanced beginner crochet stitches that you can learn after you have learned the basic crochet stitches. Many people find that it is a lot of fun to work the popcorn stitch. 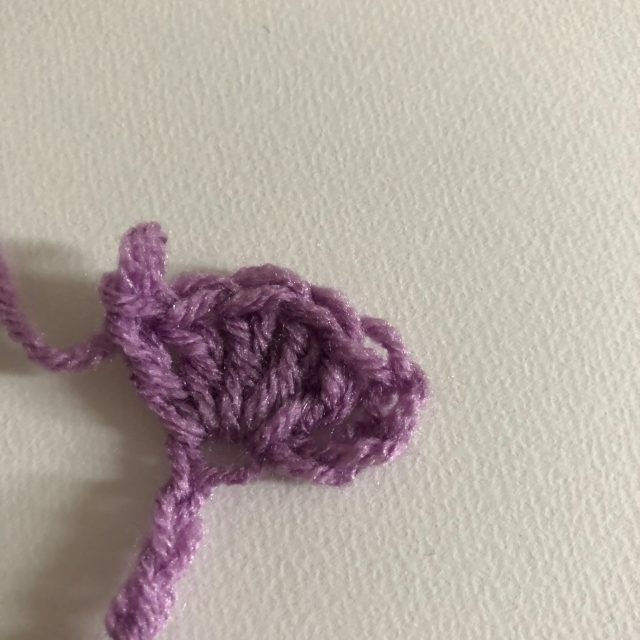 This stitch is created by working a number of stitches into the same stitch then joining the top of the last stitch in the set to the top of the first stitch in the set. This creates a ball of texture that pops off of the fabric and is called a “popcorn”. 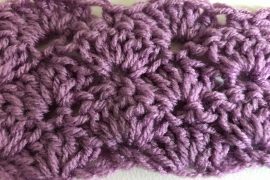 This crochet stitch can be worked in many variations by changing both the height of the stitches and the number of stitches in a group. 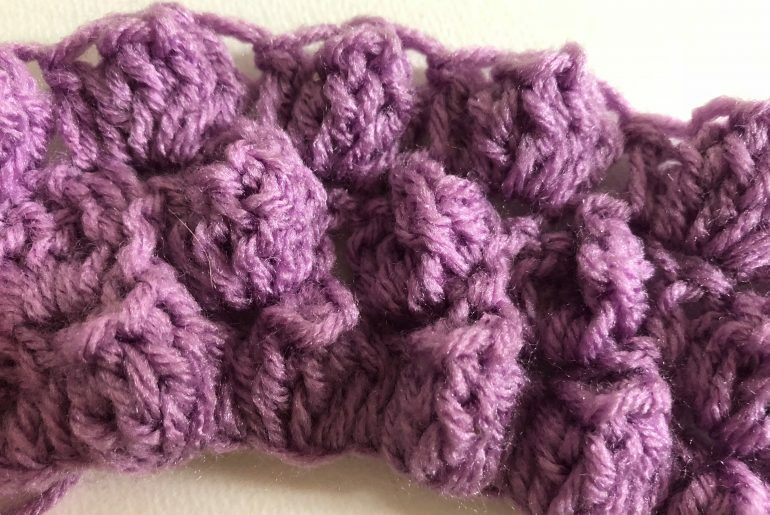 We are going to look at how to crochet a common variation – the 5 dc popcorn stitch. 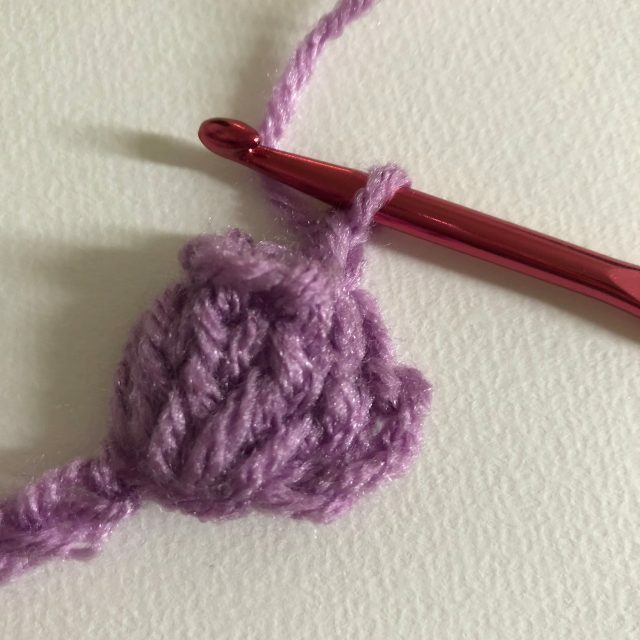 This is a fun one to practice after you first learn how to crochet. Chain an odd number of stitches. 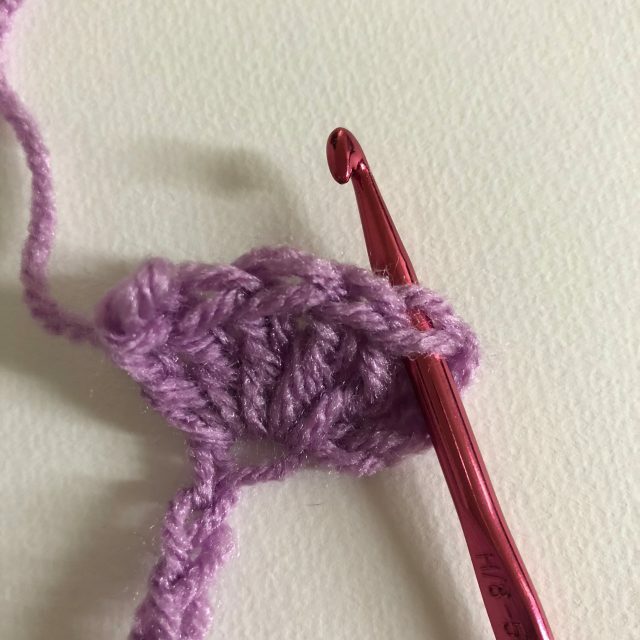 Work five double crochet stitches into the fourth stitch from the hook. At this point, it will look a lot like a shell stitch. 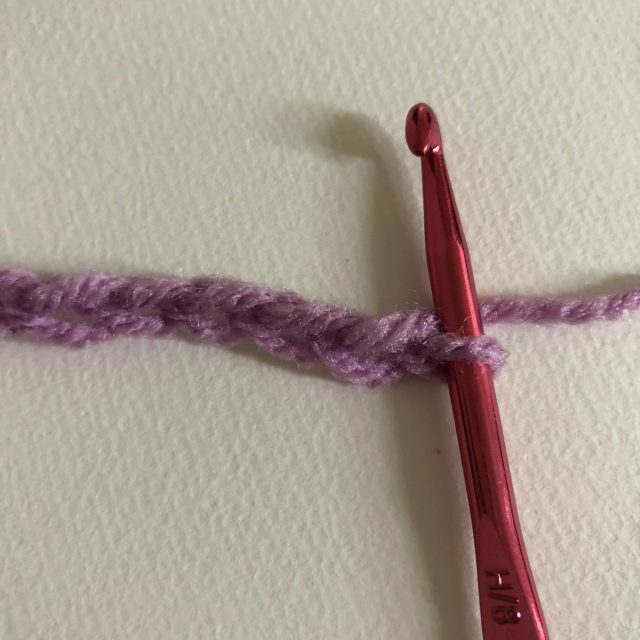 Remove your hook from the top loop of the last stitch. Re-insert it front to back through the top of the first stitch. Now insert it back through the top loop of the last stitch. Yarn over and pull through. This joins the top of the last stitch to the top of the first stitch, closing the stitches together to create the popcorn shape. 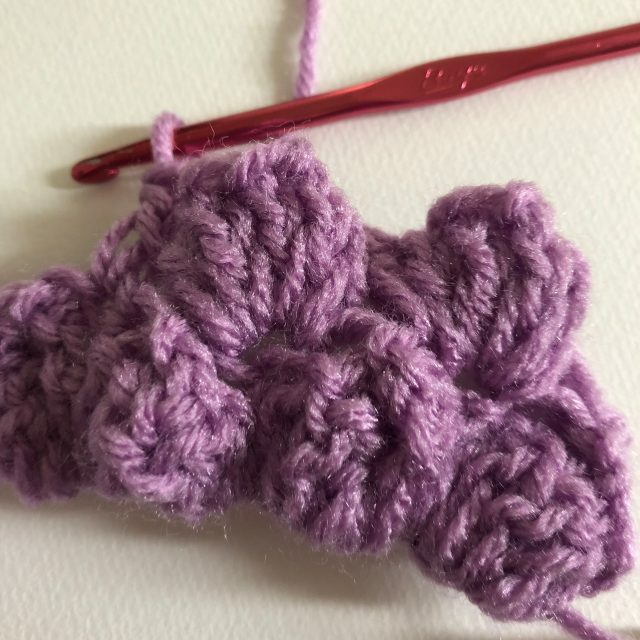 Double crochet in next stitch. 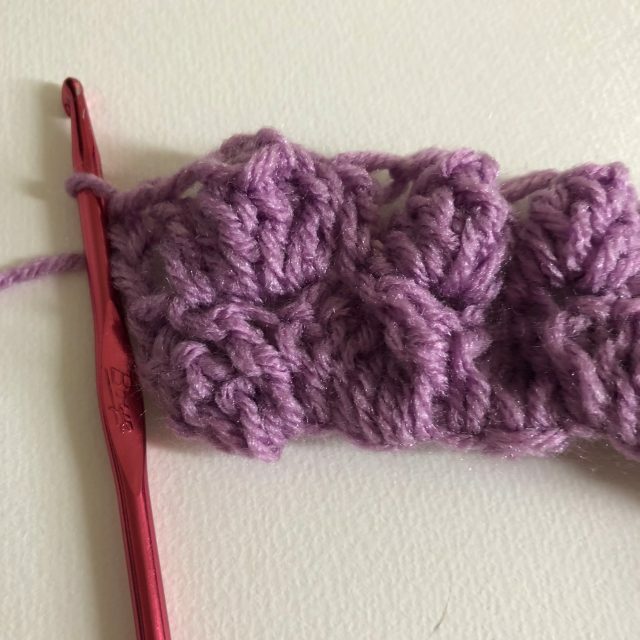 Continue across the row, working one popcorn stitch then one double crochet stitch. 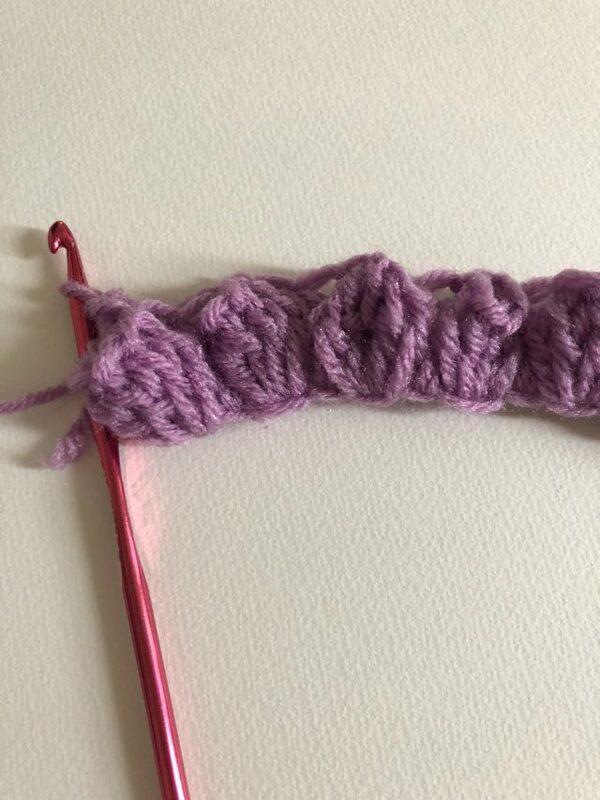 End with a double crochet stitch in the final stitch of the row. 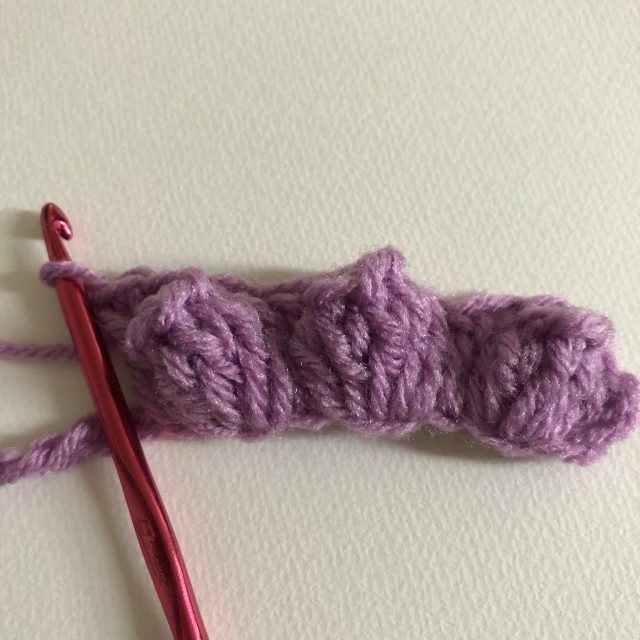 Double crochet in the next stitch, which is the top of the popcorn stitch. 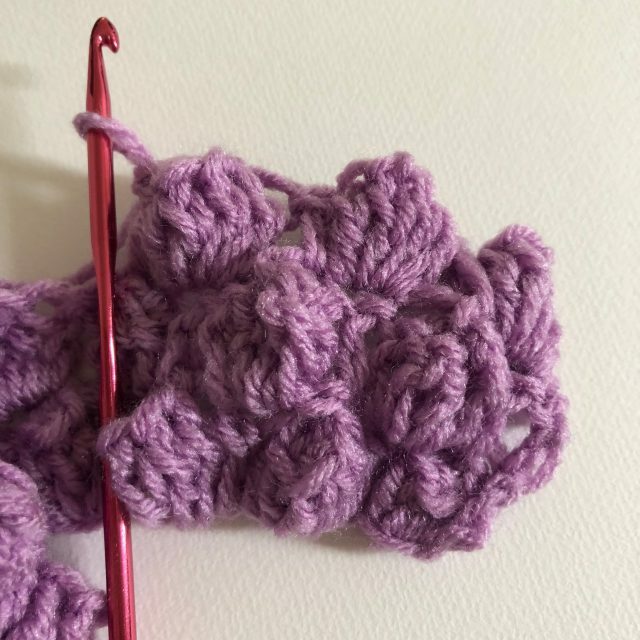 Crochet a popcorn stitch in the next stitch, which is the top of the double crochet that is between two popcorns in the row below. 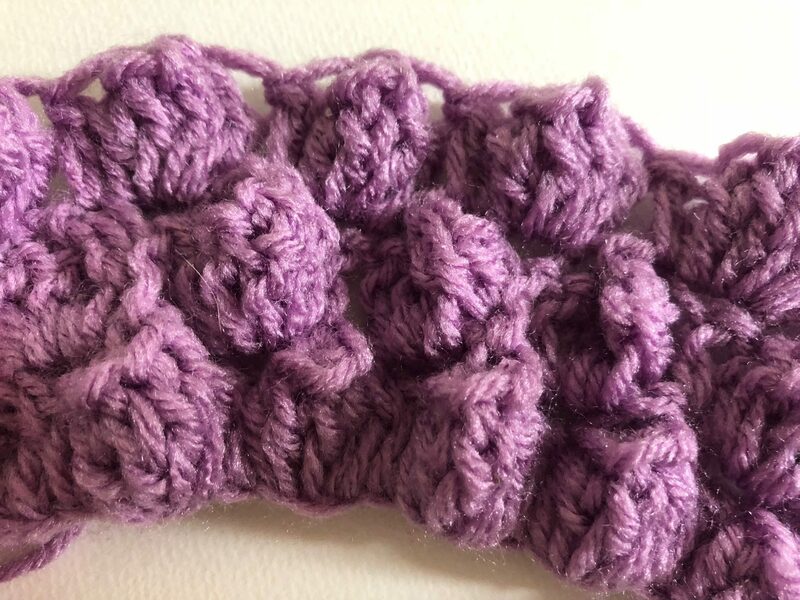 Proceed across the row, working popcorn stitches into the top of double crochet stitches and double crochet stitches into the top of popcorn stitches. 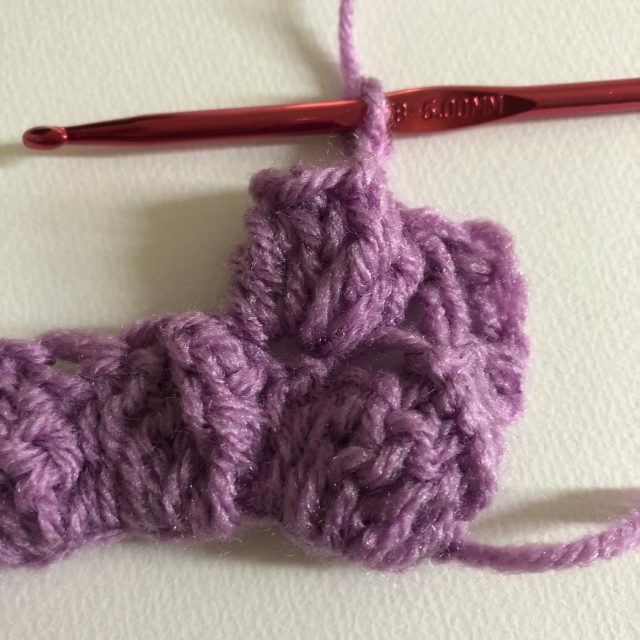 End with a double crochet stitch in the last stitch of the row. Chain 3 to turn. Continue working the pattern staggering the popcorn stitches across the row by working each popcorn into a double, each double crochet into a popcorn. Continue until your project is the desired length. 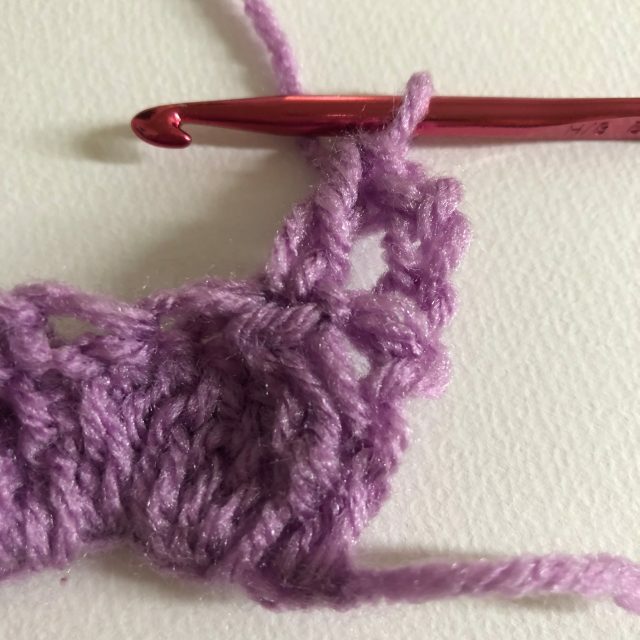 Note that this creates a fabric with staggered popcorn stitches, which is a common way of working this crochet stitch. However, you could also place popcorns on top of each other instead of staggered, creating a fabric that has even rows of these textured stitches all the way up and down. Popcorn stitch is also sometimes used as a design detail to create texture between other types of stitches, rather than worked in entire rows. 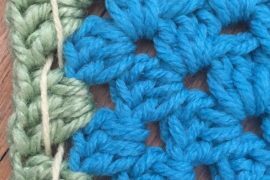 Now that you have learned how to crochet a basic popcorn stitch, look for patterns that use it to give you some practice. 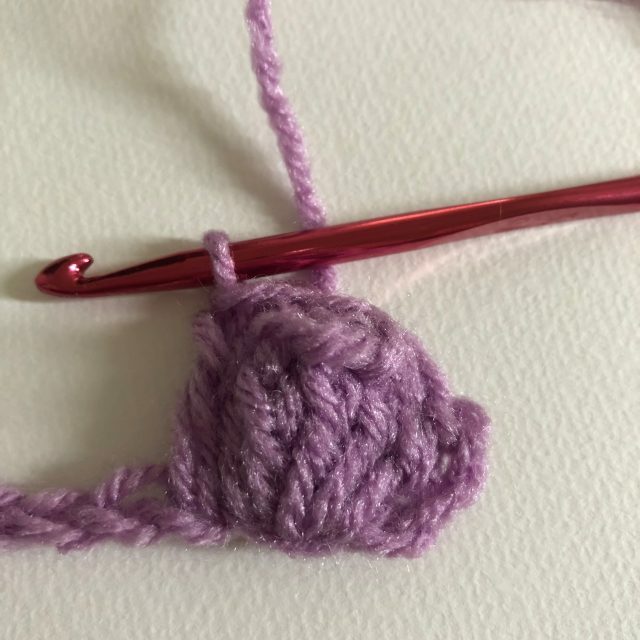 Tip: Many people find it fun to work the popcorn stitches because the double crochet stitches make it a familiar stitch but the motion of removing and re-inserting the hook is something new and interesting. That said, there are people who find that they don’t like that process of removing the hook. 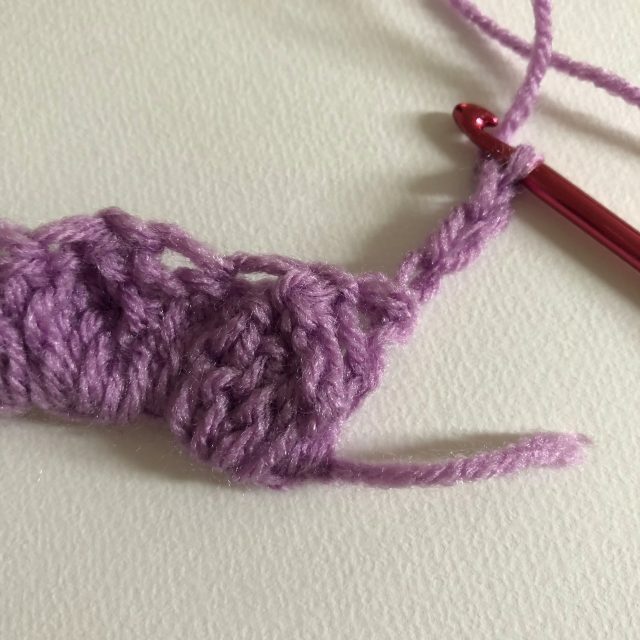 If that sounds like you, try crocheting bobble stitches instead. 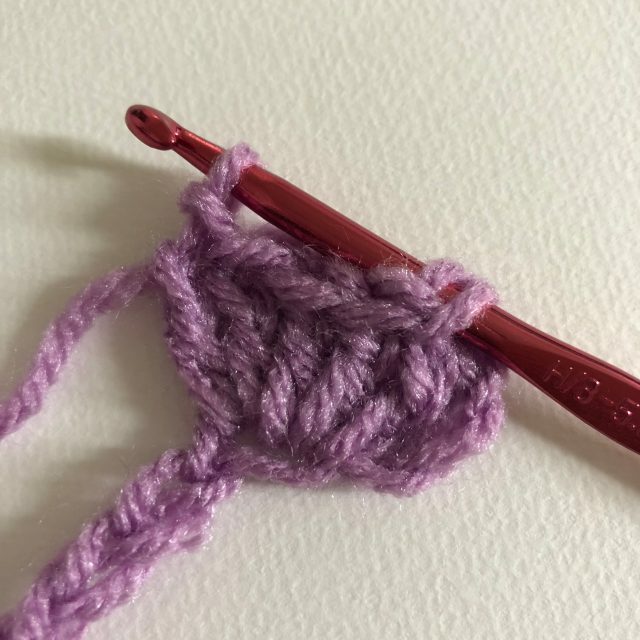 Bobble stitches have the same basic look as popcorn stitches but are made without having to remove and re-insert the hook.